Winter daylight hours have arrived. 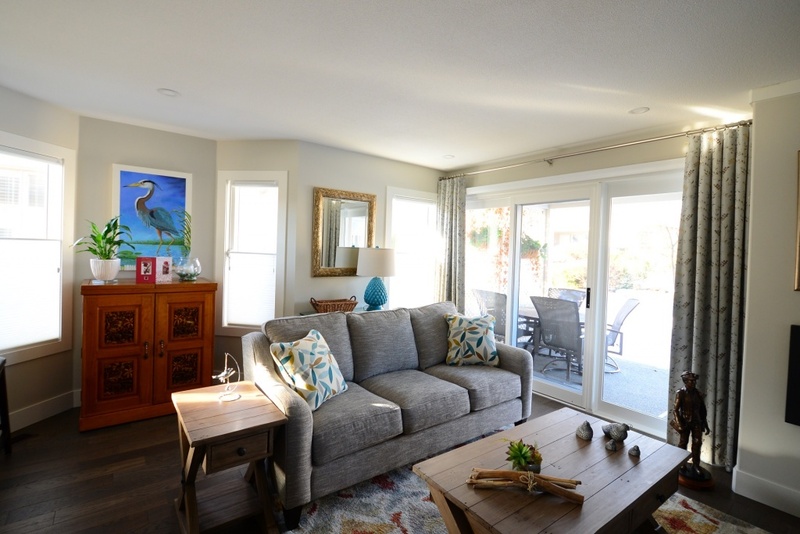 How bright and inviting is your home feeling during dreary and gray days? How are your window blinds and shutters this season? If you find your home or office feeling darker than usual, you are not alone. The Well Dressed Window can help you maximize winter daylight with Hunter Douglas Duette Honeycomb Shades. Reduce your energy consumption and lighting needs by choosing the original cellular shades. Sleek and unique, their special honeycomb structure traps air and insulates it, making Hunter Douglas Duette equally advantageous during our hot summer months. It’s all in the design. The Well Dressed Window in Kelowna doesn’t just want your windows to look great, we want them to be more functional too! Everyone can appreciate saving money and lowering their energy needs. Bedroom windows, living rooms, dining rooms, patio doors and offices can look and feel cozier thanks to Hunter Douglas Duette Honeycomb Shades. Available with operating system features including Top-Down/Bottom-Up, Duette Architella for ultimate dual honeycomb efficiency or Duette Duolite, each version comes in a wide range of colours, textures, opacity levels and pleat systems. The freedom of having cheery windows can be yours to behold in every room, thanks to Hunter Douglas Duette. 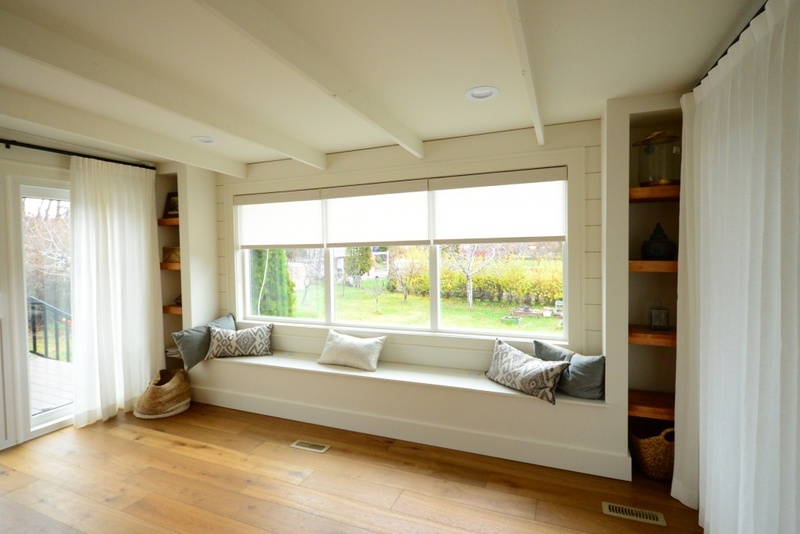 The Well Dressed Window has all of your residential and commercial window dressing needs. Upgrade your positivity and enhance your interior and exterior vibe with new window coverings from Hunter Douglas Blinds Kelowna! Now is the perfect time of year to discover just how vibrant your space can be when you take control of the ambiance. Stop compromising your privacy as you struggle with open blinds, curtains and shutters this winter. Hunter Douglas Duette lets you take control while simultaneously maximizing your style! Celebrate Savings With Our Smart Shadings Event Until Dec. 31st! 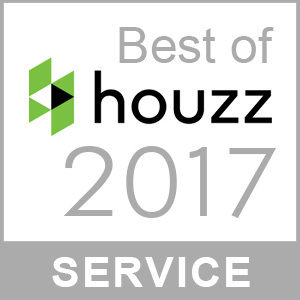 Don’t forget, now is the best time to purchase your eligible Hunter Douglas Duette Honeycomb Shades thanks to our Smart Shadings Event! 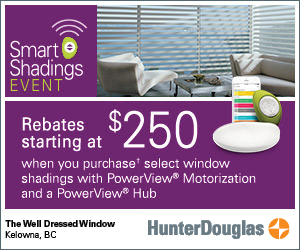 Enjoy rebates starting at $250 when you buy* select window shadings with PowerView Motorization from now until December 31st. Now is ideal for analyzing your window dressing needs. Assessing your aesthetics, versatility, energy-efficiency, privacy, ambiance and PowerView cordless technology highlights how vital window coverings are to each room in your home. The Well Dressed Window additionally offers the Vertiglide™ operating system. Match the same fabric and light options as your horizontal Duette selections for the ultimate streamlined look. Perfect for patio doors, French doors and any sliding glass doors where you want to maximize your light and your privacy. You can still feel glum even if you have not been diagnosed with Seasonal Affective Disorder or SAD. We would love to help you love every inch of your space and obliterate those dark, wintry corners! Contact The Well Dressed Window today to book your consultation. We have tons of samples, options and styles to show you. We look forward to helping you brighten up your interior!